I want to show you something I’ve been very excited to share with you for months! 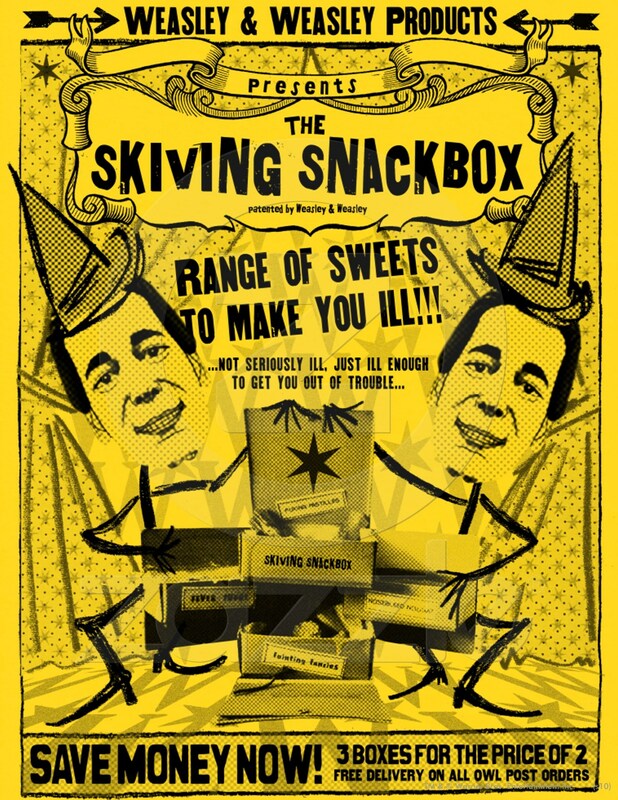 My Weasley Wizard Wheezes Skiving Snackbox. 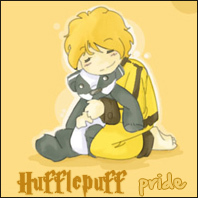 You may recall my terribly failed attempt here. Seriously, it was a disaster and has since been thrown out. It took 3 tries before I got it right – and it ended up turning out completely perfect! I absolutely ADORE it and couldn’t be happier with it. Lookie!!! 😀 Click for larger view. 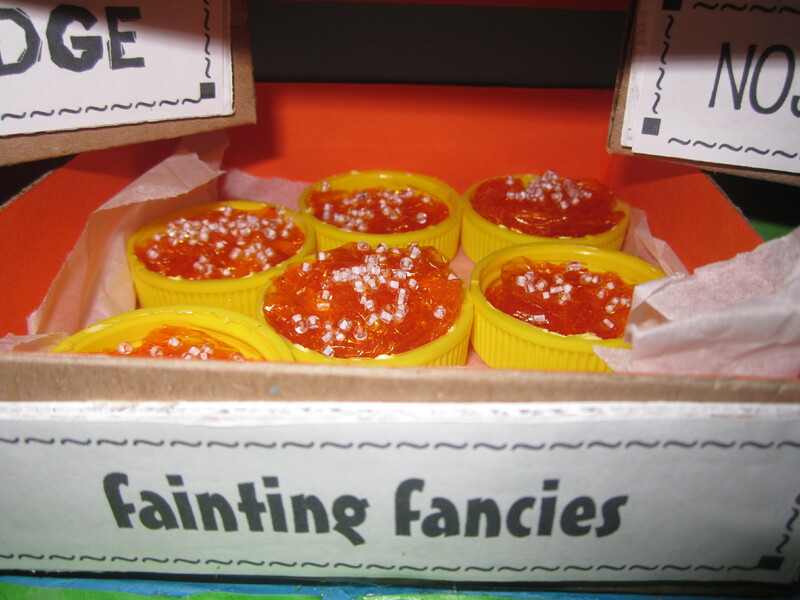 Personally, I’m not one to work with a lot of clay, or at all really; and most of the fan-made ones I found were using real food (recipes here) or clay sculptures – which, to me, looked very fake. Too smooth, too flat, and not enough texture. That isn’t to say miniature clay sculptures won’t work, I think if done correctly, they can look fantastic and incredibly edible, but the ones I found in my searches for Skiving Snackboxes just didn’t look right to me. I wanted the look and feel of the OOTP movie as closely as possible. 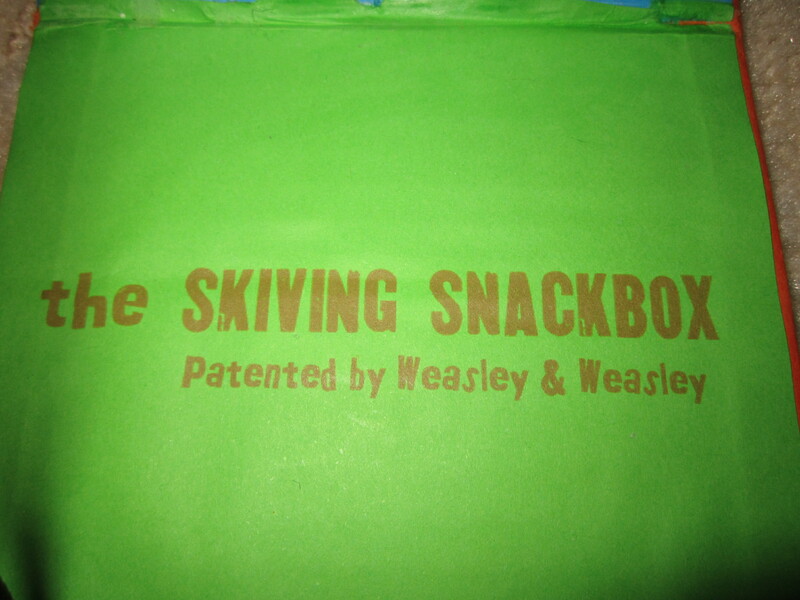 There have been a number of different versions of the Skiving Snackbox – from the above reference pictures you’ll see one has the Weasley W logo on all sides of the box, one only has it on top; then there’s the different ones from the Film Wizardry advertisement (here), and of course the new and improved red box from the Studio Tour (here). 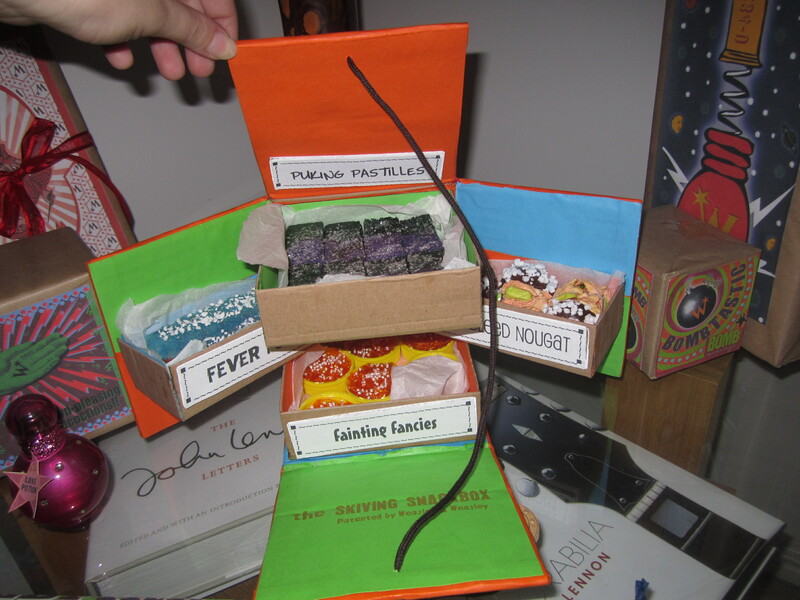 The candies also changed – from the Puking Pastilles referenced above, to the ones available at the Wizarding World of Harry Potter. 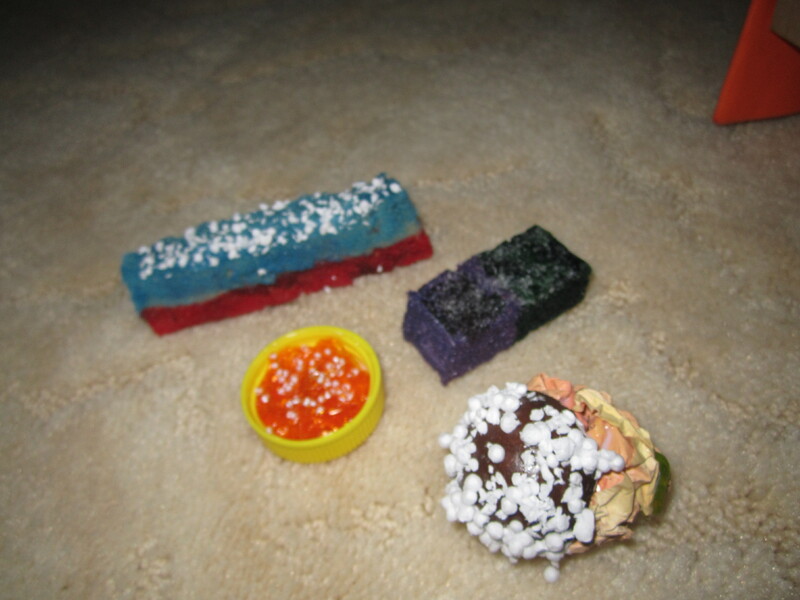 But I decided to go for the original look, with only the one W logo on top, and went about way of creating fake candies with the supplies I had available. 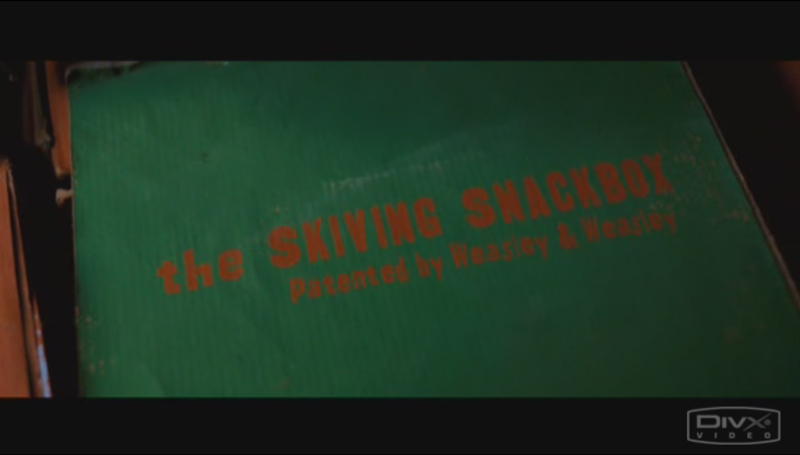 Firstly, what exactly is a Skiving Snackbox? 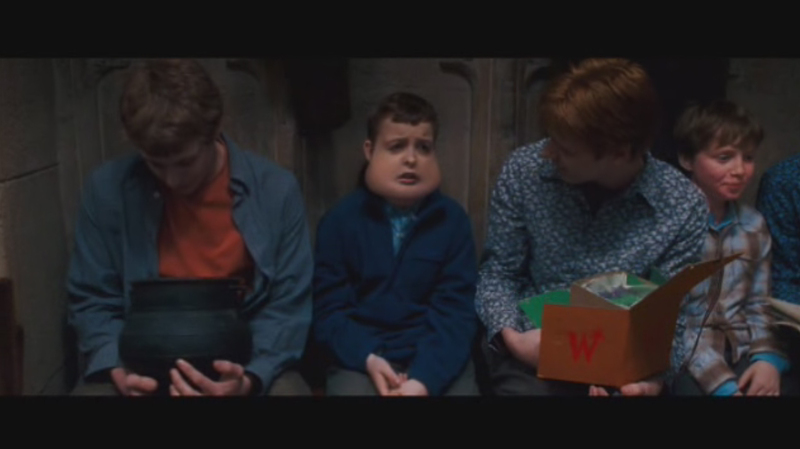 They were a product from Weasley Wizard Wheezes, described as a range of sweets to make you ill – not seriously ill, just enough to get you out of trouble. 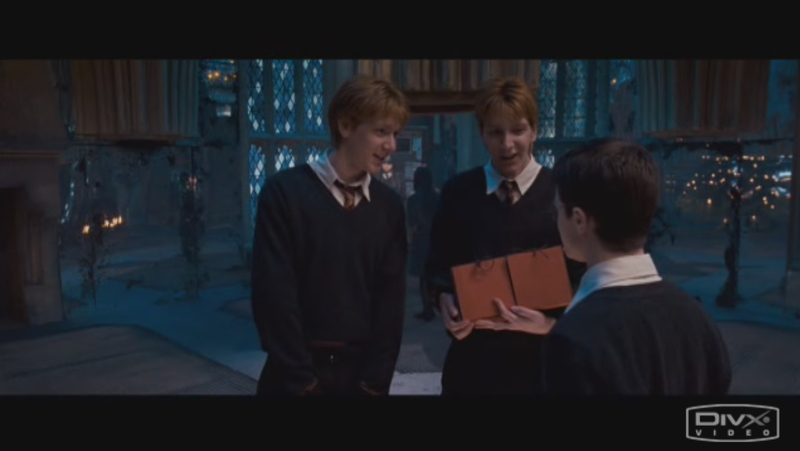 They were described in the books as coming in two colour-coded parts. Eating one side would make you ill, while the other would cure you. 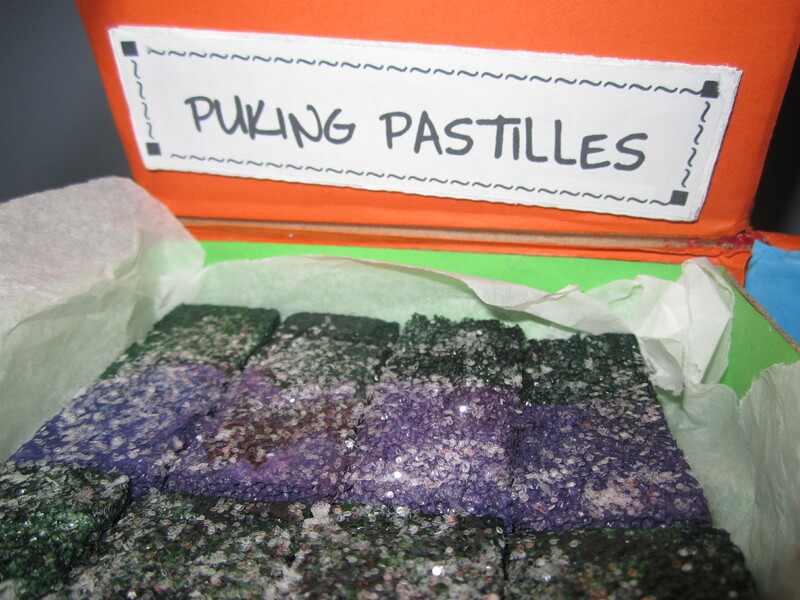 Puking Pastilles were described as orange and purple, while in the movie they were green and purple. The others weren’t described in colour, but as I was going off the movie version anyway, this didn’t really matter to me. Check out more information on the Wiki. So, you want to know how to make your own? 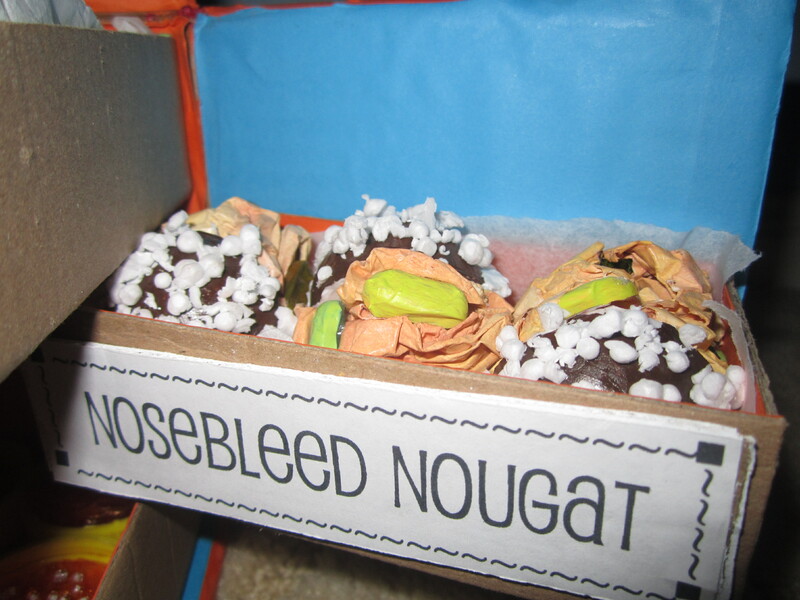 I have written out a very extensive tutorial on how to make the box and the sweets. This is available to download below, as I know things can end up quite small, lengthy, and hard to read on this blog. Everything you need to know is listed in the document, including relevant templates. Enjoy 🙂 All comments very much appreciated. I have enough cardboard to make at least two more of these, and as such I am debating selling them. Due to the amount of time and effort put into these, I likely wouldn’t sell for under $20-$25 (exc. postage). How much would you be willing to pay for something like this? 🙂 Let me know in the comments below. ~ by acciomagic on October 7, 2013. When you say one or two do you mean all the different kind for $20-$25 or just one box of something? 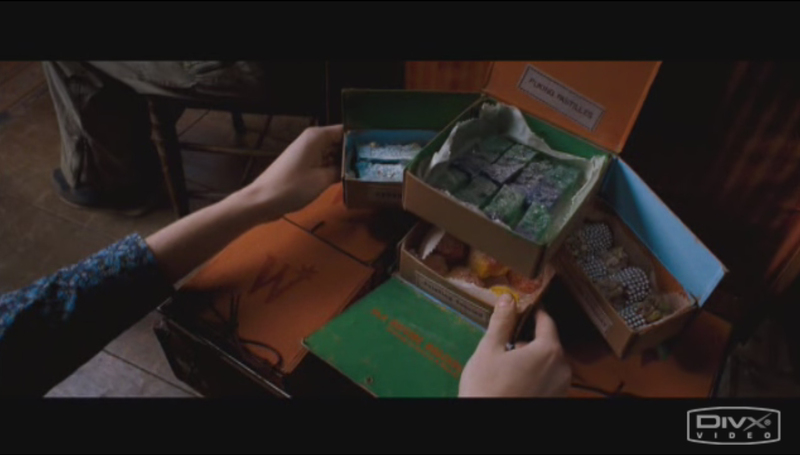 As you will see from the first picture I posted, it is 4 boxes that are attached to the inside of one big box, and it all folds up into a cube of about 14x14x14cm, as seen in the movies. 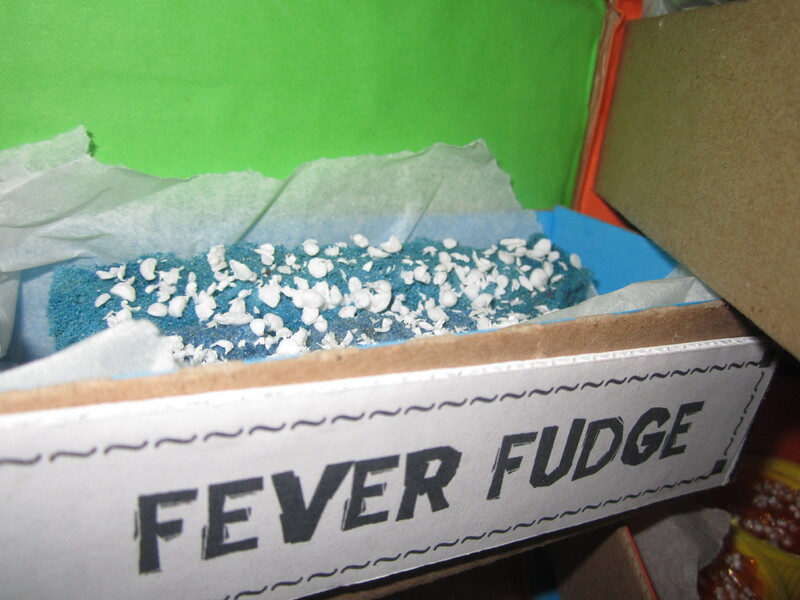 🙂 I would be looking at $20-$25 for the full box with the 4 inner boxes and the fake candies included, however I’m quite busy at the moment and am still not sure if I will get around to this. Oh the pictures are hard to see is that just one big box?